Roman Signer is not an artist over-familiar to UK audiences: he had shows at Camden Arts Centre in 2001 and Edinburgh’s lovely Fruitmarket Gallery in 2007, but shows far more regularly in Europe. 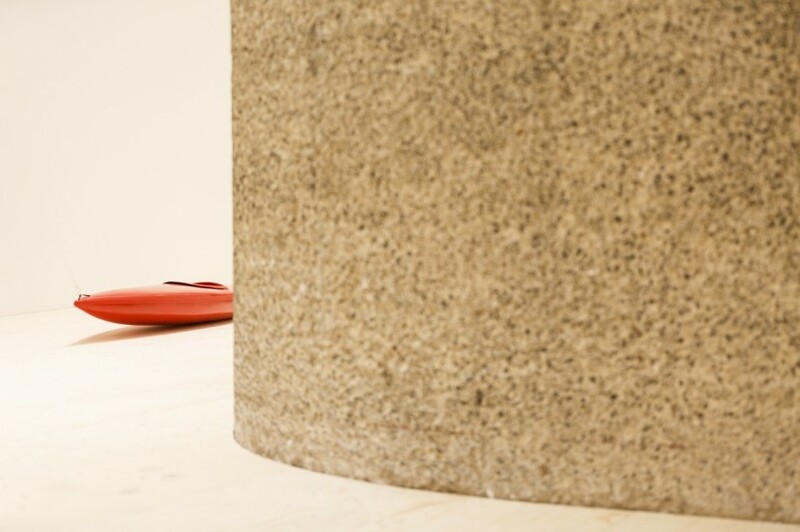 So it is very good to see two exhibitions of his work here this year, the current one at the Barbican Centre’s free-entry Curve space, and then later this year (July-September) across the border at Dundee Contemporary. Born in 1938, and resident in St. Gallen in Switzerland, Signer’s work operates within the vocabularies of object making, film and performance. Along with humour and the absurd, ‘controlled destruction’ is a term very often associated with his work – in the past he has exploded cans of paint in a gallery or activated 56 model helicopters and filmed while they rise together, collide and eventually crash to the floor. In this respect he seems to sit on the same strand of Swiss art DNA as that other great maestro of the auto-destructive: Jean Tinguely. 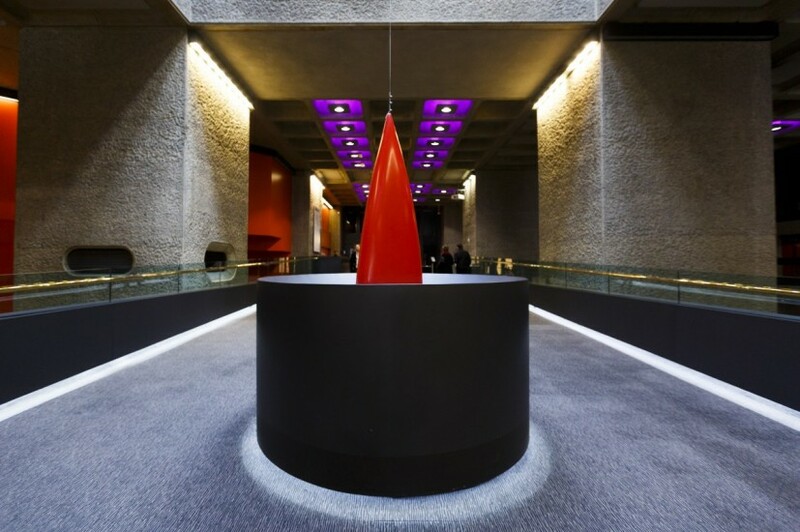 Slow Movement at the Barbican is rather gentler in tone. Two video works and an installation in The Curve are complemented by a further two works installed respectively in the Ground floor foyer and on the Lakeside terrace. 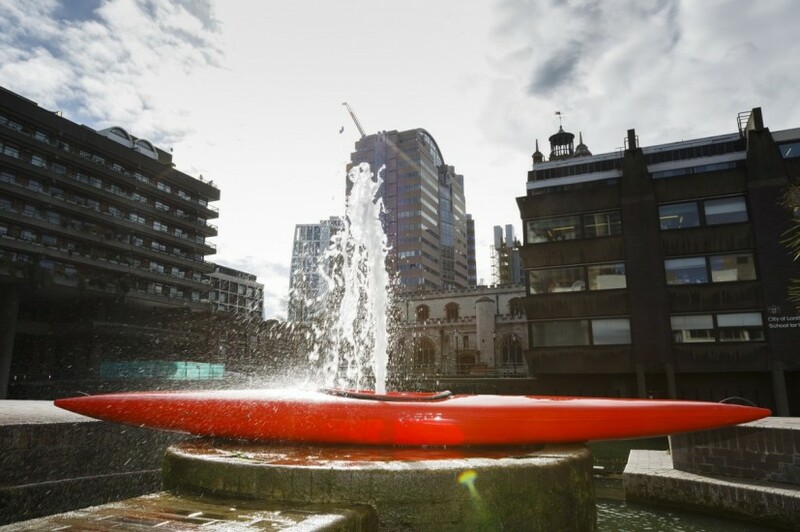 This is a kayak-based show and the slender, invariably red craft feature in all the works. Signer was for many years an enthusiastic kayaker and when he was no longer able to get out on the water, he took to using the kayak in his work. 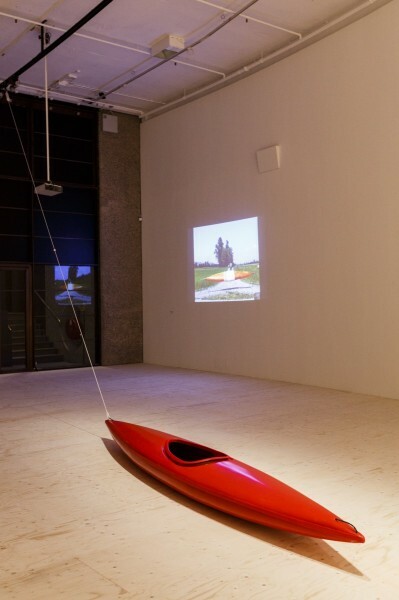 The installation that gives the show its title features a kayak hauled along the 85 metre length of the gallery on a rope pulled by a neat motor travelling on a rail close to the gallery ceiling. 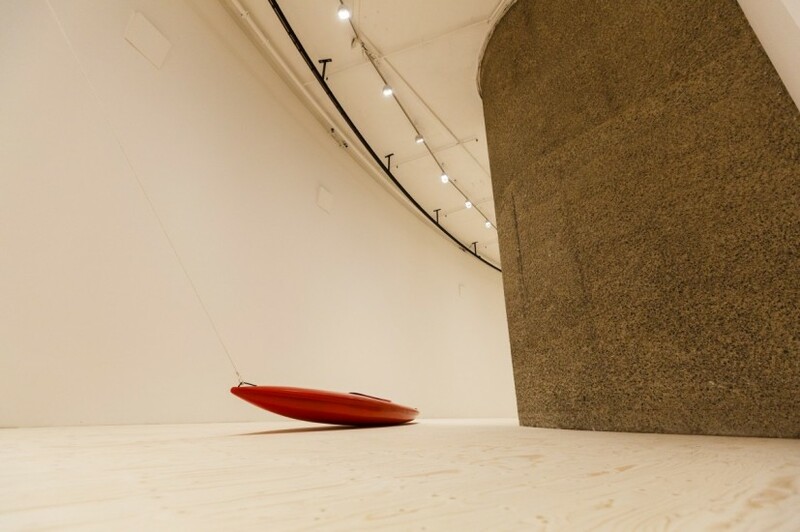 The slender red kayak cuts a diminutive form as it rounds the bend of the lofty white gallery space. It makes a silky, shushing noise as it slides over the plywood floor. Empty of any occupant, it seems to stand for the human itself, causing one to ponder the relationship to the smooth inevitability of the efficient little mechanism that dictates its course. At the end of the gallery the motor reverses and the kayak performs a shuddering 180 before stoically setting off again in the opposite direction. It is hard to resist assigning anthropomorphic qualities to the performance. Kayak 2000 features the artist being towed down a country road in a kayak tied to the back of a truck. The picture-perfect rural Swiss setting adds considerably to the absurdity of the scene, particularly when a herd of highly photogenic blond cows and calves decide to canter alongside for a spell. The same lush green flatlands feature in the second video work in which the artist set up a kayak on two spindles, wrapped a length of rope around it, tied one end to a bicycle and then proceeded to cycle off in to the distance, causing the craft to rotate clunkily as the rope pays out. There is a bathetic solemnity in the single figure peddling away into the distance that recalls Buster Keaton classics. Outside on the edge of the lake, the artist has installed a kayak over one of the fountains so that the water spurts up out of the cockpit. The gleeful panache of the gesture cannot fail to make you smile at this coda to Marcel Duchamp’s original statement on object obsolescence with his 1917 Fountain. In the foyer, the final kayak is suspended through one of the oculus features that pierce the floor between ground and basement floors. Almost ‘hidden in plain sight’ – I had to ask where it was – the tip of the kayak pokes into the space like a tongue stuck out at you when you finally spot the work. If we are all to endure until 7 May, we must deserve something occasionally to lighten the mood. Highly recommended.